The slowing of Australia’s mining boom has led to big job losses but it seems Papua New Guineans working in Australia are defying the trend and holding on to their jobs. There are around 3000 skilled Papua New Guineans working in the mining sector in Australia. Speaker: Soleiy Didwick, Vice President, PNG WA; Ben Imbun, School of Management, University of Western Sydney. In the past 12 months 20,000 jobs have been lost in the Australian mining sector. Coal has been hardest hit but gold mining and base metals such as copper and nickel are all affected. The largest community of Papua New Guinea mine workers is in Western Australia. Soleiy Didwick, Vice President of the the community organisation PNG WA, is a fly-in fly-out auto-electrician who works at BHP Billiton’s Mt Newman mine. He says Papua New Guineans are not losing their jobs. DIDIWICK: I can’t really see anything happening to papua New Guineans. Most of us are still in our permanent roles. GARRETT: Why is it, do you think, that papua New Guineans arn’t losing their jobs when other people are? DIDIWICK: One of the things that I can see, as a Papua New Guinean, I think the culture that we come from, we don’t seems to jump jobs every now and then and this probably builds trust within the employer. GARRETT: The Papua New Guineans working in Australia are the cream of the PNG workforce, often with many years of experience in tough environments. Ben Imbun, from the School of Management at the University of Western Sydney says the seniority of the roles they hold helps protect them from being sacked. IMBUN: Senior mines project engineer, senior open pit mining engineer, drill blasts you know, engineers and all that, so it is quite key jobs in supervisory some of them. GARRETT: Before the boom started to tighten you found Papua New Guineans were getting promoted faster than their Australian counterparts is that still the case? IMBUN: Still, stil the case because of the experience, their performance. In fact as I’ve heard, some of the PNGers in particular that I’ve interviewed, they said they were doing a lot of training of Australian young miners, engineers and other technical, chemists, yeah! GARRETT: Papua New Guineans are not immune from the job cuts. Some have moved from Western Australia to the Northern Territory to follow the work. Despite a skills shortage at home Soliey Didwick says none are looking to return to PNG. DIDIWICK: When we go back there, we will be underpaid like 3 times 4 times less than what we get it, here. They are not looking to go back to PNG most of them are talking to go overseas. GARRETT: So if they lose their job they will go on to another country overseas. GARRETT: Some Papua New Guinean mine workers have moved on to Asia or Africa, or joined others already working in the Middle East. Ben Imbun says the brain drain from PNG is not just affecting mining professionals. IMBUN: Also the pilots as well. You wouldn’t believe it. PNG is one of the toughest flying conditions in the world. So what had happened, Air Niugini the national airline up there it is a parallel story so I am just touching on that. Some of these local pilots are flying Abu Dhabi, Etihad airlines, even one if the flight controller, controls the whole operations, previously they flew for Air Niugini, local pilots. They have also come out, they have gone similar to the extractive industry workers. So some are flying for Cathay Pacific and so forth. Allegations of the use of mercury are among ongoing issues at the Gold Ridge mine in Solomon Islands. It is four years since the country’s sole mine was reopened – a decade on from the ethnic tensions that forced its closure. Both the mining company and the government are being urged to attend to a range of problems – from reports of river pollution to what are thought to be growing numbers of illegal miners and traders. Gold Ridge is thought to contribute about 20% of the country’s gross domestic product. St Barbara Limited took ownership of the mine just under a year ago and according to the company’s website is the sixth owner since open pit mining began in 1998. The managing director and chief executive says the company is very concerned about illegal miners – not because of the gold they’re taking but because of the risks to their safety. Tim Lehany says up to 200 illegal miners – including children – go into the pits every night and the site’s terrain and issues of customary land ownership make it difficult to stop them. He says it’s not the job of the mining company’s security team to get into physical confrontations. Tim Lehany says Gold Ridge Mine Mining Limited, is working closely with the police. He says he wants to see more people being arrested and charged. Tim Lehany says arrests at the international airport near Honiara of foreign nationals is proof that the government is trying to do something about the trade in illegal gold. He denies the involvement of Solomon Islands politicians in the trade – but Transparency Solomon Island’s chairperson Ruth Liloqula says their involvement is a known fact. She says a government minister is a licensed dealer and all sorts of other unlikely people – including nurses and students – are being used as front people for those buying the illegally-mined gold at discounted prices. But Ruth Liloqula says Transparency Solomon Islands’ biggest concern is the possibility of mercury contamination at the mine. She says Transparency understands some of the operators are either using or going to get local miners to use mercury for extraction. St Barbara’s Tim Lehany says the mining company doesn’t use mercury but he’s also heard the rumours of its use and says if they’re true, that’s a very serious issue. Earlier this year Solomon Islands’ parliament heard that villagers along the Metapona River could no longer use the water for drinking, bathing, washing their clothes or fishing – nor could they grow crops along the riverbanks. But Mr Lehany says if that is the case it’s nothing to do with Gold Ridge. Tim Lehany accepts that human effluent is unlikely to affect crops but they could stop growing for a variety of reasons. But the MP who represents the communities who live downstream of the mine’s tailing dam says they have additional concerns. Martin Sopage says more than five thousand people would be affected by a dam failure and they want the mining company to discharge some of the water. But Tim Lehany says lifting the tailings dam is no cause for concern. But Tim Lehany says the company has a licence to discharge water from that treatment plant, which it uses to clear the water of cyanide, arsenic and other toxins used in the mining process. He says the company has done everything that is reasonably required of it and has been in continual discussions with the environment department. TWO major investigations will be carried out by the National Government relating to the exit of BHP and the establishment of PNG Sustainable Development Program Limited. Prime Minister Peter O’Neill announced yesterday that the first investigation will review the manner in which BHP was given an unconditional indemnity as part of its exiting Ok Tedi Mining Limited, and the second into major spending by the PNG Sustainable Development Program since its establishment. Mr O’Neill said the review into the circumstances surrounding the granting of the unconditional indemnity to BHP for environmental and social damage by the then Government, in which Sir Mekere Morauta was Prime Minister. “The Government needs to ascertain whether any breaches of the Constitution, or the laws of Papua New Guinea was involved in the agreement, which was personally negotiated by the then Prime Minister,” he said. “We will make the report public, and then take advice from the government’s lawyers on whether further action is justified. The fact that Sir Mekere was appointed chairman of PNGDSP, and then OTML, within a short period of his departure from the national Parliament raises serious questions in the minds of many people, given the influence BHP continued to exercise after it allegedly ended its involvement in OTML. Mr O’Neill said many MPs and concerned citizens and business people from the Western Province and elsewhere had raised with him serious concerns about the spending by the PNGSDP on major projects that had either lost money or never eventuated. The national Government will appoint an independent, highly regarded accountancy firm to conduct an audit of spending on major projects by the PNGSDP since its establishment. “Two projects that clearly must be independently assessed are the millions of kina lost on the Cloudy Bay timber project, and the expenditure of perhaps more than K100 million on feasibility studies on the Daru port project. “There are claims that money has just been wasted, and the project is as far away from being developed as ever,” he said. Mr O’Neill said the national Government would make public the report of the independent audit, and implement any recommendations it made. “I am sure the independent auditors will look into the approval processes for the spending, and why so much money belonging to the people of the Western Province has been wasted,” he said. Mr O’Neill said he hoped the chairman, board and management of the PNGSDP would co-operate fully with the independent auditor. “This is about transparency and accountability-and it must also be about not making the same serious errors in spending on major projects again,” Mr O’Neill said. In the meantime, the Government will ask the Taskforce Sweep team to investigate huge spending by the management and board of PNGSDPL, including hiring of consultants, where millions of kina have been used for projects which have failed to materialise. “These are monies belonging to the people of Western Province. They have the right to know their funds have been managed, by those trusted to do so. Those responsible must face the law like everyone?” PM O’Neill said. THE third review on the Memorandum of Agreement for the Porgera project that was signed 24 years ago was completed in Kokopo, East New Britain last week with a revised version by the end of the week. In 1989, under a tripartite arrangement, the Porgera MoA was signed between the national and provincial governments, and landowners. Contained in the agreement were benefit sharing arrangements and projects to be undertaken by various parties mineral royalty payments, special support grant, tax credit scheme, equity, Porgera Long Term Sustainable Development Plan, law and order, environment protection, preference in supply and procurement, local business development, training and employment, and Porgera township development among other issues. Following the outcome of this review, some new clauses were added into the MoA to include issues like resettlement, review timeframe, law and order, and women in mining. These were not in the existing MoA and will be included in the revised version. During the review, Barrick was invited to be a party to the MoA but declined saying it was happy to participate in development arrangements with the MOA parties as the project developer. It also made a commitment to honor projects and developments that would require its input during the meeting. According to Dr Ila Temu, the company has many other agreements in place in for many of the issues similar to the ones contained in the MoA that are current and are yet to be fulfilled. “Any commitment in the MoA for Barrick to come in, we will take in. The review was concluded last Saturday, with all parties agreeing for the revised MOA draft to be finalised and submitted to cabinet for approval. Winners are grinners, Bougainville Copper Limited (BCL) Chairman, Peter Taylor, and the largest individual BCL shareholder, Axel Sturm, recently met at the opulent Goodwood Park Hotel in Singapore to discuss Bougainville’s future. 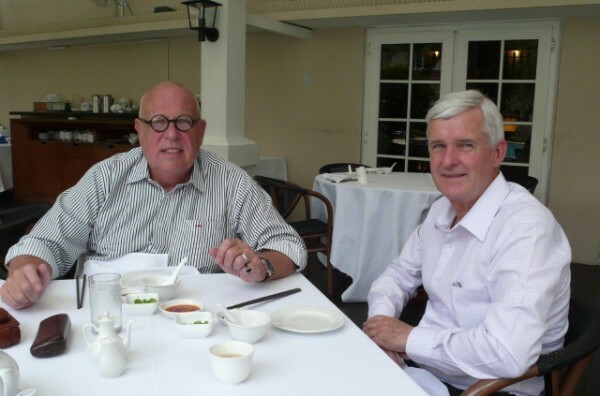 Axel G. Sturm and Peter R. Taylor having lunch in Singapore. In recent years Sturm has become a frequent commentator on Bougainville affairs. His knack for insulting sound bites has made him a favourite among journalists. Many of Sturm’s most legendary sprays are launched via the European Shareholders of Bougainville (ESBC) website which he administers. There he has slammed Bougainvillean leaders, writers and filmmakers accusing them of being ‘criminal terrorists’, ‘fanatics’ and ‘mentally sick’. Sturm has also attacked PNG statesmen and decorated foreign commentators who he accuses of being ‘naïve’, ‘delirious’ and dishonest. “As chairman of Bougainville Copper I am restricted in what I can say due to corporations’ laws. You do not have the same restrictions. Your analysis of the situation on Bougainville is appreciated” (ESBC Website, May 2011). “Dear Leonard, the Bougainville Crisis was a nasty experience – for sure! But I believe that the Second World War was even worse for Bougainvilleans. Certainly one must not forget what happened and one has to learn from mistakes. But touching old wounds regularly is not helpful at all for healing” (PNG Attitude, 3/11/2012). “We shareholders – as I understand, Rio Tinto, also, is a major shareholder – we are OK to invest another US$5 billion into the mine [on which they will make a large profit – PNG Mine Watch]. And I think that is more than enough compensation for a situation that was not caused by Bougainville Copper” (Radio New Zealand, 16/7/13). “The mine was closed nearly 20 years ago mainly due to the secessionist conflict in which BCL was made responsible. Therefore, we believe that it would be a friendly sign of the Bougainvillean landowners to invite BCL to come back to work on the island” (Post Courier 8/5/2008). “I consider him as a poor, delirious old man who is more and more out of his mind” (ESBC Press Release, 26/6/2011). “Sam Kauona is one of the alleged murderers of the so called Bougainville Revolutionary Army (BRA)! He is on the pay-roll of foreign notorious backdoor players! Most of his life he spent as a hardened criminal terrorist by intimidating, robbing and also presumably killing innocent Bougainvillean citizens” (ESBC Website, 27/2/2013). Sturm accuses Porabou of being a “fanatic”. He claims: “Clive Porabou – mislead and remote-controlled by anarchic left-wing ecologist groups in London (UK) and Australia – still continues spreading lies and jealousy in the internet and on the ground” (ESBC Press Release, 5/4/2011). “Parabou: In this regard, the closing down of Panguna Mine involved blood and the loss of lives of twenty thousand fighters, innocent children, men and women from the Southern tip to the Northern isles of Mekamui/Bougainville. Sturm on Daveona in 2008: “When I met him in May in Port Moresby, I had been deeply impressed by Lawrence Daveona. He is the ideal mediator in this sensitive issue. He has our confidence and our full support as well. Earlier than others Lawrence understood that the only way of bringing enduring peace and prosperity to the island of Bougainville means first of all getting all parties concerned together” (ESBC Website, 7/7/2008). Sturm on Daveona in 2013: “It is true that for many years the ESBC supported Mr. Daveona’s efforts to resume mining by BCL. Unfortunately I had to stop funding Mr. Daveona because of his increasing inappropriate behaviour towards Bougainville’s President, Dr. John Momis and myself. Sadly there was no more sustainable cooperation possible for the benefit of Bougainvilleans. Today, quite obviously, Mr. Daveona follows his very own agenda and private interest which is proved by his recent statements. He does not have any regard for the people of Bougainville or even the Panguna landowner’s future” (Mine Watch PNG, 29/6/2013). Dr Lasslett’s research uncovered evidence confirming Rio Tinto’s infamous role in the Bougainville conflict. Sturm claimed: “It’s really shameful if an expert in criminology completely ignores facts and reality. Your naive adoption of statements and claims from rebel groups on the ground disqualify you as an honest scientist [Dr Lasslett’s claims are based on statements made by BCL Managers and internal BCL records – PNG Mine Watch] …I suppose your work in Ulster [Northern Ireland], a region well known for rebellion and organised crime, troubled your vision…Unfortunately you are also allowed to spread your ideas among you students. You shall not use your academic position as a platform for indoctrination and agitation” (PNG Attitude, 26/4/2012). Thomson produced a powerful piece on Bougainville’s tragic past, including material on Rio Tinto’s role in the hostilities. Sturm responded: “Thomson’s loud presentation dismantles him as a naive and unprofessional 3rd class journalist” (ESBC Website, 26/6/2011). Thomson has won two Walkley Awards and a UN Peace Prize. INSPIRED: Xzannjah, who plays Matilda, and Hugh Laurie as Mr Watts. Rawiri Paratene spent his first night in Papua New Guinea in police headquarters with Andrew Adamson. The pair were not there as law breakers, mind, but for the rather frightening reason that the 2011 Japanese tsunami had just struck and the Pacific island was vulnerable. Fortunately Papua New Guinea remained safe and Paratene could continue working there as acting coach for the film Mr Pip, directed by Adamson. The film was largely shot on Bougainville and Paratene, who spent a total of four months on the island, worked with many locals – untrained actors who had roles as villagers – and lead actress, newcomer Xzannjah. In fact, the only person on Bougainville to appear on screen that Paratene didn’t coach was the experienced Hugh Laurie. For the unacquainted, Mr Pip tells the story of a young girl, Matilda (Xzannjah) stuck in the ruinous clutches of war on Bougainville, all the while being inspired by her teacher, Mr Watts (Laurie), who reads Great Expectations to his class. Published in 2006, the critically-acclaimed novel earned its author, Lloyd Jones, a place on the shortlist of the Man Booker Prize. The film adaptation is a magnificent work, cinematically beautiful, and with marvellous acting. It is, in turn, funny and harrowing. The depiction of conflict during the civil war, which lasted from 1988 to 1998, is raw and affecting. Gladstone, near Brisbane, after her mother got a job there.